Hungover? These Guys Will Deliver Vanilla & Cold Coffee Bottles To You! Fresh Brew Co. is the latest cold brew delivery to send bottles of cold coffee to our workstation/couch. 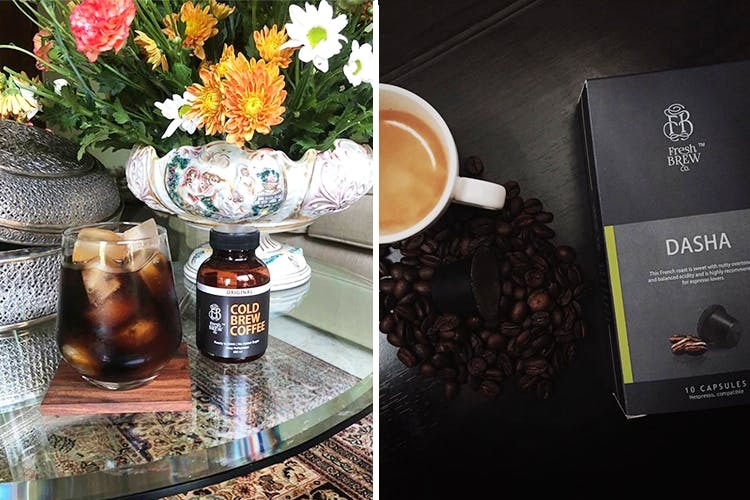 Since they pride themselves on using 100% Arabica Ground coffee beans, they are low on acidity and don’t leave any of that bitter aftertaste. Their rich brews come in three exciting flavours: Vanilla, Hazelnut and Original. They last for 21 days from their brew date and can be had hot, or ice cold. The folks behind the venture know their coffee, and ensure that they brew it in small batches to ensure everything’s fresh. The Vanilla has no added sugar or preservatives and the hazelnut’s extracted from the plant itself, and lends itself beautifully to the rich aroma of coffee. Each pack comes with four bottles of 200ml each. The price starts at INR 375 and goes up to INR 475 for the flavoured versions. If possible, place your order a day or two in advance and you can get your supplies anywhere in Delhi and NCR.